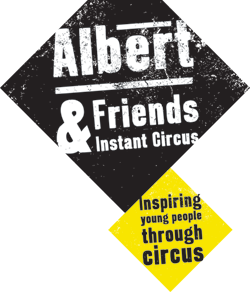 Albert & Friends Instant Circus (A&FIC) exists to develop the physical and creative potential of children and young people using circus and the physical arts. Born in the summer of 1983, A&FIC has subsequently gained worldwide recognition for its highly skilled, innovative circus theatre performances. Its reputation and performance schedule now extend far beyond the boundaries of London and the rest of the UK. New York, Paris, Rome, Frascati, Edinburgh, Beijing, Hamburg, Ljubljana, Maastricht and Adelaide have all applauded the skill, charm and daring of London’s Premier Youth Circus. Our work with young people with physical and learning difficulties is highly regarded by teachers, parents and the participants who gain so much more through learning circus-confidence, self-belief, flexibility, team work, tolerance, spatial awareness, commitment and respect not only for themselves but for everyone around them.